We continue to add new capabilities to our lightweight R package, doAzureParallel, built on top of Azure Batch that allows you to easily use Azure's flexible compute resource right from your R session. Combined with the recently announced low-priority VMs on Azure Batch, you can now run your parallel R jobs at a fraction of the price. We also included other commonly requested capabilities to enable you to do more, and to do it more easily, with doAzureParallel. 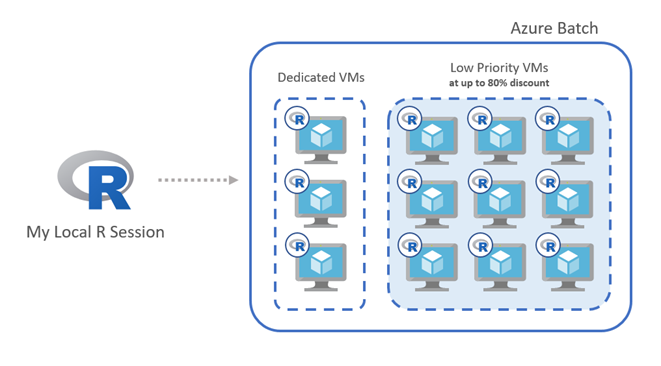 Our second major release comes with full support for low-priority VMs, letting R users run their jobs on Azure’s surplus compute capacity at up to an 80% discount. For data scientists, low-priority is great way to save costs when experimenting and testing their algorithms, such as parameter tuning (or parameter sweeps) or comparing different models entirely. And Batch takes care of any pre-empted low-priority nodes by automatically rescheduling the job to another node. You can also mix both on-demand nodes and low-priority nodes. Supplementing your regular nodes with low-priority nodes gives you a guaranteed baseline capacity and more compute power to finish your jobs faster. You can also spin up regular nodes using autoscale to replace any pre-empted low-priority nodes to maintain your capacity and to ensure that your job completes when you need it. doAzureParallel is extremely easy to use. With just a few lines of code, you can register Azure as your parallel backend which can be used by foreach, caret, plyr and many other popular open source packages. # 4. Create your cluster in Azure passing, it your cluster config file. For more information, visit the doAzureParallel Github page for a full getting started guide, samples and documentation. We look forward to you using these capabilities and hearing your feedback. Please contact us at razurebatch@microsoft.com for feedback or feel free to contribute to our Github repository.